ASIA NEWS IT REPORT: The victims were all Uzbeks. Yesterday, the repatriation of bodies. 30 of them have already been identified. "We still have a lot to do for our people" forced to look for work abroad. Tashkent (AsiaNews / Agencies) - "The tragedy in Aktobe indicates many things, including the fact that we still have a lot to do for our people. People must look for a job in other countries, because we have not created any possibility for them ". This is how Uzbek President Shavkat Mirziyoyev comments on the death of 52 Uzbek citizens in a bus explosion on January 18. The Uzbek head of state prayed yesterday for the victims at the Khakimi at-Termez mausoleum (see photo 2). Prayers of condolences were held in all the mosques of the predominantly Muslim country. 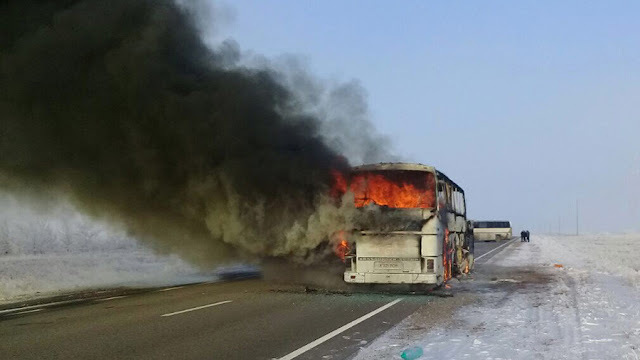 The "Ikarus" bus caught fire on the 1,068 kilometer of the Samara-Shymkent road in the Irgiz district. On board there were two drivers and 55 passengers, almost all - with the exception of two Kazakh citizens - of Uzbek citizenship. Of the people on board, only five managed to save themselves. At the moment, investigations are still under way, but a malicious origin of the fire has been excluded. Yesterday morning, the plane of the Uzbek Ministry for Emergency situations left the region of Aktobe carrying the 52 bodies, 30 have already been identified. Shukhrat Teshaboyev, Uzbek consul in Kazakhstan, adds that the bodies still lacking in identity will be subjected to DNA tests in Uzbekistan.